If you thought you couldn't get a real Android tablet from a brand you've heard of for less than $200, think again. Lenovo's just announced the IdeaPad Tablet A1, a 7-inch Android unit that we got a sneaky first glimpse of back in July. Now it's real, and it's cheap, it's running Gingerbread, and while it doesn't hold a candle to the Galaxy Tab 7.7, it honestly feels like something far above its price point. Read on for our impressions. There are plenty of cheap Android tablets out there, but most have sketchy construction and many are locked out of the Android Market -- meaning no Gmail app, no Maps, and none of the other built-in Google goodies. That's not the case with the A1, which is running Android 2.3 Gingerbread on a single-core Cortex A8 processor. 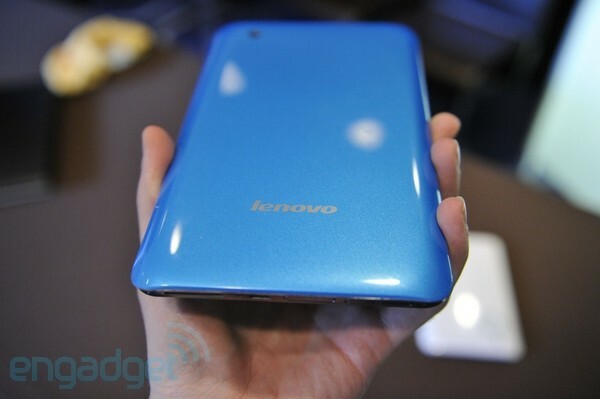 It has front- and rear-facing cameras (the back one rated at three megapixels) and a 7-inch, 1,024 x 600 display. Again, those are specs that don't compare to the Samsung Galaxy Tab 7.7, but something tells us you won't be able to score one of these for the $199 asking price that the A1 starts at. For that you'll get 8GB of storage, but a 16GB model will go for $249, 32GB for $299. We're told only the 16GB and 32GB models will be shipped to the US, which is a bit of a shame, as with both microSD and SD expansion it'll be fairly easy to add more. Connectivity is limited to WiFi, but there is a GPS in there, so it could make for a passable navigation device. This certainly isn't the slimmest tablet on the market, but it's very comfortable to hold in the hand, and Lenovo says it has the same sort of magnesium alloy rollcage inside as used on ThinkPads, here adding durability and stiffness. Also, it's available in pink, and you don't see that every day on a tablet. We did find the blue a bit more fetching, but we won't think less of you if you opt for the more refined black or white options when this thing ships sometime later this year. Update: In case you're wondering, yes, we asked if it would be upgraded to Honeycomb. We didn't get a straight answer, but it didn't seem particularly likely.